usonian | MTI: Masonry Technology Inc. I recently received an email with a link to a planned community that Frank Lloyd Wright was involved with back in the 1940s. Recently, Forbes magazine set out to do an article on the 10 Prettiest Neighborhoods in the U.S., and this 1940s Wright project, the only Frank Lloyd Wright planned community to actually reach fruition, was named one of the ten. Located in Pleasantville, New York, this Usonian community built almost three-quarters-of-a-century ago still reigns as a model of beautiful design married to a naturalistic theme. Wright’s quest for buildings that grow organically from their surroundings was perfectly realized here. According to the article, Wright designed three of the homes and approved the designs for the other 44. All these homes can be classified as Usonian. According to About.com, Frank Lloyd Wright coined the phrase “Usonian”, which he derived from the words United States of North America. These homes were supposed to be democratic in nature, and their design was to avoid the ostentatious and lean toward the pragmatic. They usually were one story homes without basements and garages and according to Wright, affordable by the “common people.” (A bit patronizing, maybe?) The Usonian-style was a major contributor to the development of the ranch-style home of the 60s and 70s. The real beauty of this 100 acre community to me is the way it coexists with the land on which it is built. I had a chance to visit one of Wright’s Usonian homes this fall in Southwest Wisconsin, and that blending with nature aspect was what struck me most. It was not a blight on the face of land on which it sat, but rather a perfect complement like the solitary call of a loon echoing across the surface of a serenely calm northern lake. I don’t know if it was by chance or by plan that Wright chose to be involved with planning the perfect Usonian community in “Pleasantville,” but it is certainly the perfect appellation. For an architect of Frank Lloyd Wright’s stature and ego, to pursue affordable architecture for the average person seems out of character. But that was the goal of his Usonian dream. Based on the Populist and Progressive ideas of elevating the common man, Usonian (a term pulled from United States of North America) architecture sought to democratize building. Wright’s Usonian homes were simple, one-story homes, of modest square footage, without a garage, a basement, or much storage. They were also modest in exterior adornment. Like the earlier Prairie School houses, the Usonian homes usually featured low roofs with large overhangs and open living areas. Bernard Pyron wrote that for Wright, “Nature, Democracy, Spirituality, Culture and Art all became talismans that he used to promote the ideas spawned from this worldview.” As a result, Wright came to believe that members of the middle and lower classes might be cultivated to appreciate great art and to develop as individuals in a free, democratic culture. In Frank Lloyd Wright’s mind, to accomplish this meant developing a uniquely American architecture that was affordable for all. All these beliefs led to the development of his Usonian architecture. Wright’s Usonian homes aimed at using as much local material as possible, a sustainable idea that Wright had long supported, and one he used in the construction of his own home, Taliesin. Wright also wanted these homes to be compatible with their natural surroundings; to flow from them and blend naturally with the landscape. He wanted organic structures with lots of natural materials and lots of windows that made use of natural light, and that allowed the inhabitants to experience the land around them. 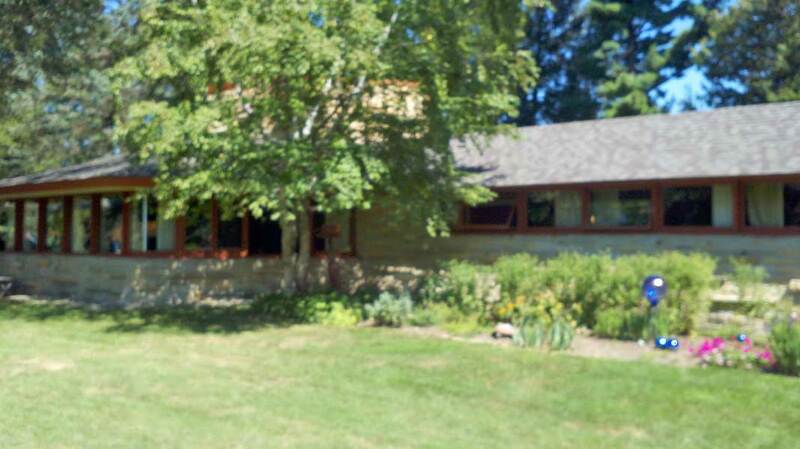 My wife and I happened to stumble on an open house at one of Wright’s Usonian homes while on a motorcycle ride in southern Wisconsin this past weekend. I feel very fortunate to have been given the opportunity to walk around the grounds and to take pictures of the exterior of the home. I am not going to reveal the location of this property as it is still occupied by family members of the original owner, and their privacy needs to be respected. For that reason, I am going to be purposefully vague on certain details. The house was designed around a core structure of limestone that juts above the main roofline. This central structure contained the kitchen, laundry and a small bath. To the east of this core was the master bedroom and a carport. (The carport was later turned into more living space using a design by a Wright apprentice. The addition blends seamlessly with Wright’s original design.) Projecting out to the north from the core limestone tower is a hexagonal living space adorned with lots of of windows. There is also a patio area with a partial low rock wall adjoining this portion of the house. The bedroom wing stretches south from the hexagonal living area, and is also heavily adorned with windows on its west side. A flower garden flows alongside the bedroom wing culminating in a man-made rock glen patio at the south end. The stonework in the walls of the home is beautiful and intricate. Although Usonian homes were supposed to be lacking external adornment, the walls of this house feature individual pieces of limestone that jut out creating interesting patterns and shadows, as well as lending a sense of organic construction. Much of this limestone was actually quarried by the owner and then hauled to the building site early each day before he went to his office. The home is a treasure, and I feel fortunate to have spent some time with it. It blends naturally with the surroundings, and is easily missed from the street. When first built, it had an open view overlooking a valley to the north-northwest. Sixty years later, Nature has reclaimed much of the hilltop, but you can still see the valley through a small opening. Wright said, “I would like to have a free architecture. Architecture that belonged where you see it standing—and is a grace to the landscape instead of a disgrace.” I think he and the owner succeeded here! *The slideshow below was organized as a counter-clockwise walk around the property, beginning in the paved parking area at the front entry. The walk goes towards the east, around the original master bedroom area, then around the family-main living area, along the bedroom wing then through the flower garden and back to the paved area in front of the house.